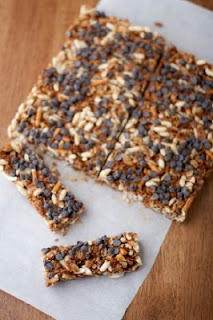 Granola bars are a perfect portable snack food for my husband's breakfast while he is working, the children's lunch box for a treat, or a nice break after a long walk in the woods. The beauty of this recipe is that it is kid friendly for making and eating. It is a no-bake recipe, so go ahead and get the kids in the kitchen cooking! Like the granola, you can make this according to your own tastes. 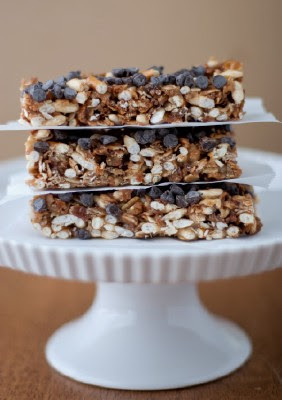 You can add dried fruit, more nuts, use different sweetners, omit the chocolate (do you really want to do that). Just experiment and find out what flavors suit you the best. For me, I had some brown rice syrup that I have been wanting to use, but you can use honey instead. The original recipe called for Rice Krispies, but I had some puffed rice cereal on hand. I did use the thin pretzels because I love a sweet and salty combination. I felt my granola was already sweet enough so, I reduced the amount of sugar. And the chocolate, well I don't know one person who doesn't like it (I gotta work on her). My twist was substituting part of the brown sugar for peanut butter. Mmmmm--peanut butter and chocolate, salty and sweet. This is starting to turn into a no-bake cookie. That's alright with me! Line an 8x8 inch square baking pan with parchment paper leaving excess on the side for easy removal. In a large bowl combine the granola, puffed rice cereal and pretzel sticks. In a small pot, bring the butter, brown sugar, peanut butter and rice syrup to a boil. Lower the heat to a simmer and stir until sugar is completely dissolved, 2 minutes. Pour the sugar mixture over the granola mixture and mix thoroughly until all the granola is coated with the sugar. Transfer the mixture to the prepared pan and press firmly. I like to use a piece of plastic wrap lightly sprayed with non-stick cooking spray over my hand to press. Sprinkle the top with the mini chocolate chips and press firmly again. Place in the refrigerator to set, about 20 minutes. Cut into 16 bars. Store in an air tight container for up to 4 days or in the refrigerator for up to a week. Enjoy! Thanks, Jennifer! 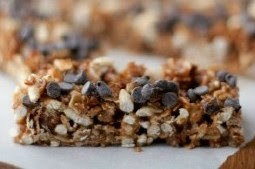 The pretzel does put a delicious spin on the granola bar. Nicole, I love the detailed comments about the recipes and the pictures are so attractively done! I can't wait to try these recipes. 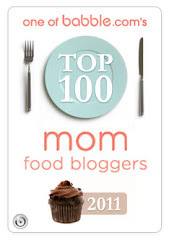 Great that you started this food Blog!! I'm so glad your Mom told me about your blog! These granola bars are fantastic. I've made them several times to rave reviews...thanks for sharing! I am so glad you enjoyed the recipe. Thank you for letting me know!